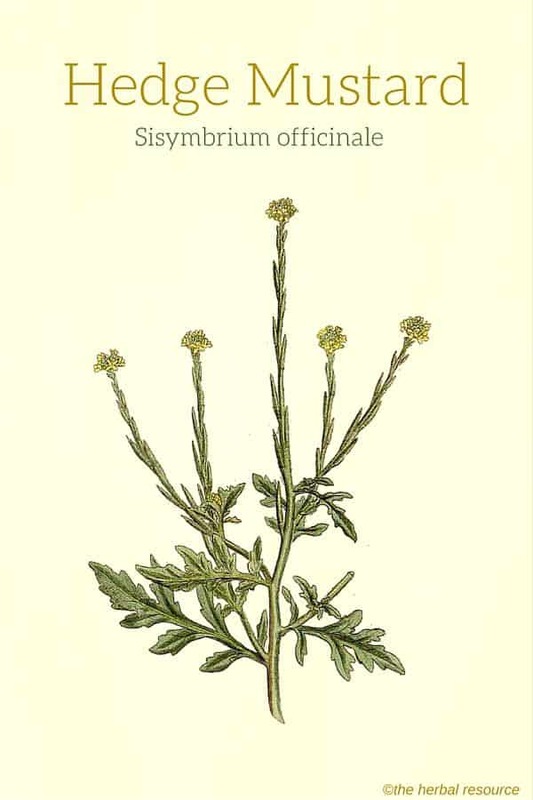 Other Common Names: Common hedge mustard, bank cress, singer’s plant, rank vejsennep (Danish), Weg-Rauke (German), erisimo (Spanish), herbe aux chantres (French). 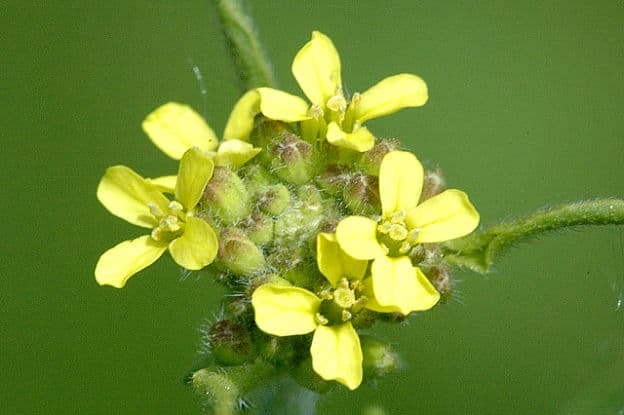 Habitat: Hedge mustard is found growing wild in most of the European cauntries, Southwest Asia and North Africa, and it has been introduced to both North and South America, South Africa and Australia. Today the plant is widely cultivated for its edible leaves and seeds. 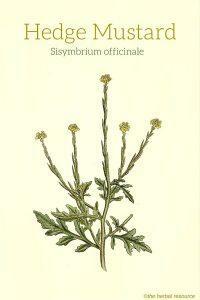 Description: Hedge mustard is an annual plant belonging to the cabbage family (Brassicaceae). The plant can grow up tp 30-60 cm in height and has widespread stalks and deep-green hairy leaves. The plant blooms in July or August and the small pale-yellow flowers have petals that are 2-4 mm long. Plant Parts Used: The whole plant or just the flowering tops are used as herbal medicine. The plant is collected in the summer and may be used in liquid extracts. The plant should be used fresh, as the dried herb has a very little medicinal effect. Active Ingredients: The plant contains glucosinolates, cardiac glycoside, polysaccharides, essential oil, vitamin C, enzymes and flavonoids. 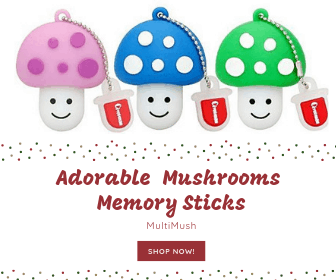 Additionally, it contains tsothiocyanates, compounds that are formed from the glucosinolates and are believed to be responsible for most of the medicinal effect of the plant. Pedanius Dioscorides (1st century AD) called this plant erysimon and recommended that is should be used together with honey as an antidote in case of poisoning. He also stated that it could be used as a treatment for a variety of diseases and ailments. One of the better known traditional use of the herb was to treat hoarseness or a complete loss of voice, and for this reason, the plant was sometimes called the singers’ plant. Pliny the Elder (23-79 AD), a Roman author, naturalist, and philosopher claimed that the herb was extremely good against a cough and as an excellent remedy for throat inflammation. 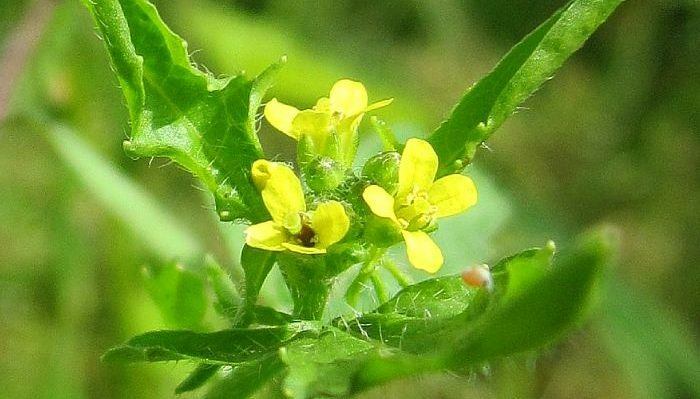 Hedge mustard was also used as folk medicine for ailments such as the common cold, gallbladder ailments, jaundice, pleurisy, sciatica and ulcers. The fresh mashed herb was used externally as a remedy for gout and rheumatic ailments. Because the herb is rich in vitamin C it was used to keep scurvy at bay, and also as a diuretic agent. Almost all of these uses go back to Pliny and his writings. The essential oil extracted from hedge mustard contains sulfur compounds which can create a reflex reaction when they come into contact with the mucous membranes of the mouth and pharynx. This, in turn, increases blood flow to the larynx and bronchi and allows for easier expelling of irritating mucus material. The herb may, therefore, have a dampening effect on cough, throat irritation and inflammation. In addition, the herb has an expectorant properties and can be used as a remedy for inflammation of the pharynx (pharyngitis), hoarseness, or voice impairment (aphonia) caused by inflammation of the vocal cords (laryngitis) and bronchitis. Hedge mustard contains (particular the seeds) cardiac glycosides, similar to those found in foxglove (Digitalis purpurea). These glycosides are organic compounds that act on the contractile force of the cardiac muscle and are mostly used in the treatment of cardiac failure. Although the glycosides found in hedge mustard are weaker than those found in foxglove the herb should not be consumed by people who have heart problems of any kind without consulting a qualified healthcare professional. The fresh leaves can be eaten raw or cooked and used in salads, soups, sauces, and omelets. Hedge mustard contains glucosinolates that break down and form a mustard oil similar to those found in “real” mustard plants like black mustard (Brassica nigra), brown mustard (Brassica juncea) and white mustard (Sinapis alba). A herbal tea can be made by using 50 g of the fresh herb in 1 liter of water. The tea may be sweetened with honey for better taste. The recommended dose of the tea is usually 5-6 cups daily. Hedge mustard should not be used by children or the elderly, especially those with heart problems. Some literature states that only the leaves of the plant should be used as herbal medicine because the flowering tops (the seeds in particular) contain relatively high levels of cardiac glycosides. These glycosides can be toxic and affect the heart in negative way.